Pulse width can be modulated by envelope or both LFOs. Resonant filter with low pass, high pass, band pass and notch modes. 2 tempo-sync Arpeggiators in series for complex arp sounds. Arp tempo, range and note length can be adjusted. Modulation envelope can control pulse width and pitch of individual oscillators as well as filter and dirt. 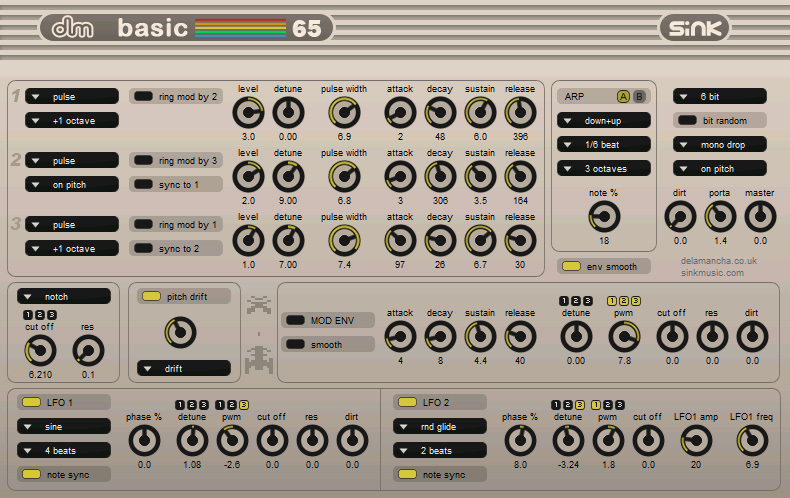 2 tempo-sync LFOs with wide range of waveforms, including random. Both LFOs can control pulse width and pitch of individual oscillators. One LFO also controls filter and dirt, the other can modulate the depth and speed of the first LFO. Envelopes are non-linear and can be retriggered from zero or smoothed on each new note. Pitch drift models instability with variable depth and frequency. Options for 4, 6, 8, 12 or 16 bit audio with randomising feature. Developed with SE 1.1, so no problems with multiple instances. 128 presets by sink covering arps, leads, bass, drums and lofi sounds.